Wallpaper, rugs, and unicorns—oh my! 1. Hello Kitty fans rejoice! 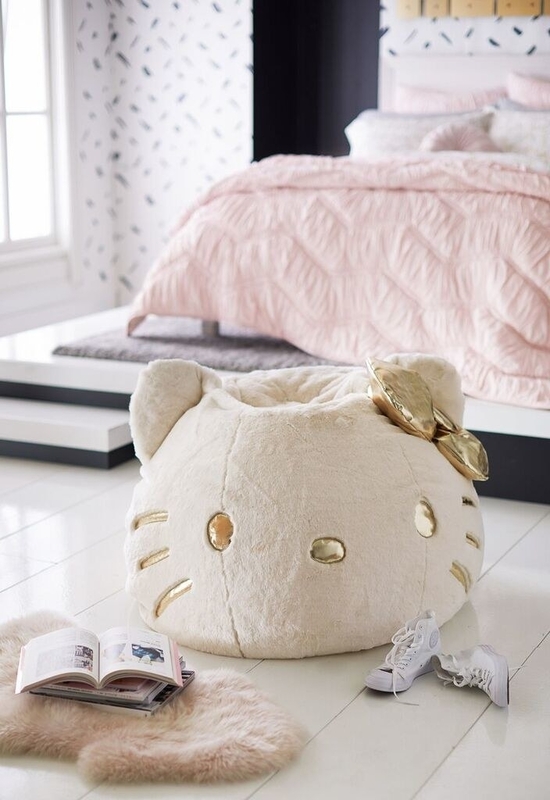 PBteen has a new adorable Hello Kitty collection with bedding, bath decor, desk accessories, and much more, so you can surround yourself with the world's most iconic cat! Get the bean bag above for $179+, lamp for $149, throw pillow for $35.50, and HELLO sign for $125! Check out the full collection! 2. American Eagle and the dorm decor experts at Dormify have a new bedding collection that may actually make you excited to sleep on a twin XL (don't worry, it comes in other sizes too)! The Dormify collection for American Eagle includes comforter and duvet cover sets for $129+ (available in sizes Twin/Twin XL or Full/Queen), throw pillows for 36+, and throw blankets for $36+ (available in two colors). Get the tie dye comforter and sham set above from American Eagle for $179. 3. PyroPet's newest addition to its candle collection is a unicorn that goes from majestic to creepy AF when you burn it! This is the latest from the people who made the adorable cat, bunny, and many more animals that turn into evil skeletons when melted! Get it from 54celcius for $35 or Hot Topic for $31.92. 4. Society 6 now includes coasters, trays, and cutting boards (in thousands of designs from independent artists) in its tabletop collection. Get them from Society 6: coasters for $12/set of four, trays for $37+ (available in two sizes), and cutting boards for $25 (available in two shapes). 5. Parachute's newest (and most exciting, in my opinion) home item is, drumroll please..... a dog bed! Now you and your pup can snooze in style. Get it from Parachute for $129+ (available in small and large). 6. 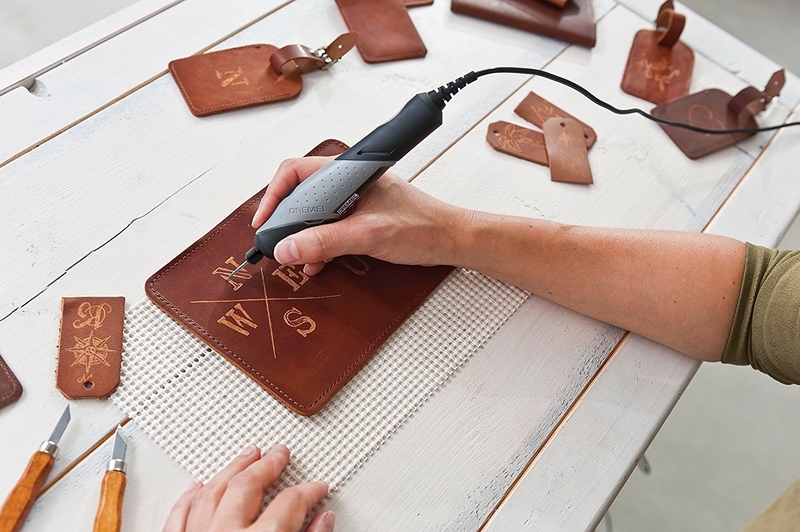 Dremel's smallest tool yet (the Stylo+) is ideal for crafters who etch glass, burnish leather, make jewelry, etch wood, and so much more. 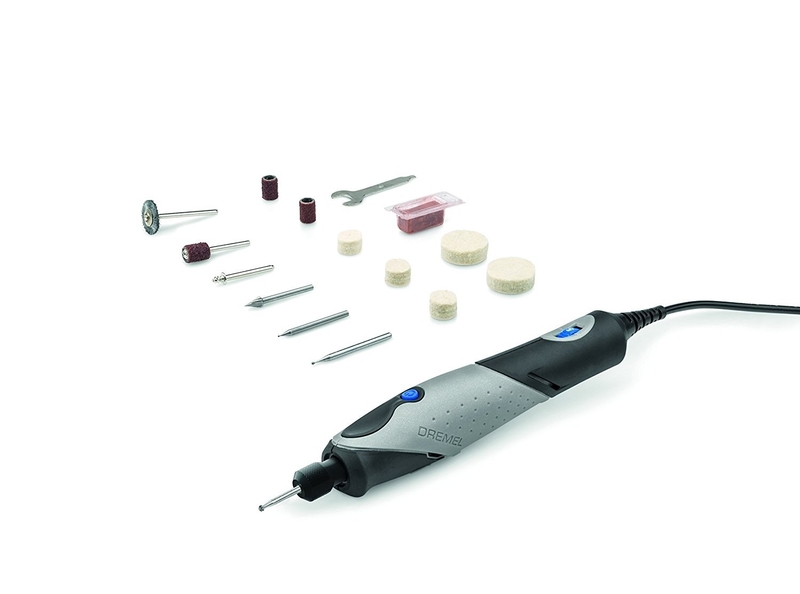 Kit includes the Stylo+, three high speed cutters, a diamond wheel point, five felt polishing wheels, polishing compound, a carbon steel brush, two 60-grit sanding drum, a 120-grit sanding band, a mandrel, a Dremel wrench, and an instruction manual. 7. 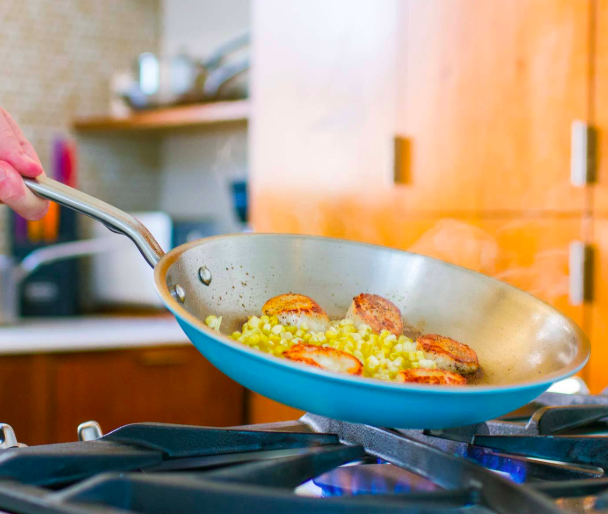 Made In is ready for summer with its new line of colored stainless-steel frying pans in popsicle red, bikini blue, and fresh cut green. 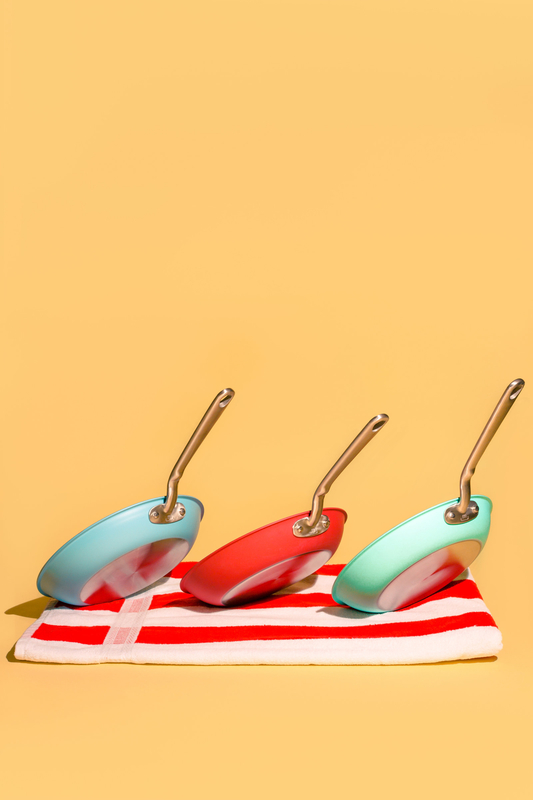 Get them from Made In for $89+ (available in two sizes and three colors). 8. Tempaper partnered with Novogratz on a new collection of temporary wallpapers that are perfect for commitment-phobes who want to experiment with bold patterns and style. The collection features 11 temporary wallpapers for $39.99/small roll or $125/large roll. Get the palm temporary wallpaper above from Tampaper for $39.99. 9. Tempaper also just released a limited edition collection for its 10 year anniversary. The collection is a fun update on their first ever pattern. Go Tempaper... it's ya birthday! Get it from Tampaper for $40+ (available in two sizes and four colors). 10. Interior Define has a new customizable dining collection that's exactly what modern minimalist dreams are made of. The new collection includes the Hayes Table for $900+ (available in four finishes, three shapes, and multiples sizes) and three chairs: the Audrey chair for $350+ has a curved back that gives it a glamorous feel, the Dylan chair (above) for $350+ has a simple classic design, and the Kit chair for $350+ has a versatile design that would fit in either a formal or a casual dining room (all the chairs are available in 75+ colors and leathers and nine different legs colors/materials). All the options really let you customize our dining space to be exactly what you want! 11. A new brand called Revival Rugs carries one-of-a-kind vintage rugs from around the world at affordable prices. Check them out to get an eclectic vibe in your space without ever leaving the comfort of your home. Get vintage rugs from Revival Rugs starting at $117. They also carry one-of-a-kind vintage pillow covers! You loving your new decor!